How Do I Know If I Am Allergic To The Sun? Let's look at the questions that may help to address some skin changes where you are perhaps unsure of their exact cause. Have you noticed raised bumps, a rash, hives or itchy skin lately after being out in the sun? Is this a new condition after enjoying the suns rays for many, many years? You may be suffering from a sun allergy. You can have bouts of allergic reactions on the skin which can be intermittent and difficult to assess what is going on. As we get outside more with the nice weather, areas of our skin that were covered up all winter, are now soaking up the suns wonderfully warming rays. Yet, some women which have gotten a bit too much sun seem to get these hive like welts on the areas that also get a bit sunburned. Whether it be the chest, shoulders, upper arms or back portions of the body. But what seems odd, is our legs and lower arms don't seem to be affected as much. "Allergic reactions to sunlight occur when ultraviolet radiation triggers changes in your skin cells. These changes cause your immune system to mistakenly identify proteins in your skin cells as harmful invaders. Your immune system then releases antibodies that attack the cells and this leads to symptoms. For most people with a sun allergy, exposing bare skin to bright sunlight during the spring or summer triggers the allergic skin reaction. However, some people can have a reaction during winter months. In people who have a severe sun allergy, an allergic reaction may even be triggered by indoor lights. Certain medications, chemicals and medical conditions can make the skin more sensitive to the sun (photo-sensitivity). For example, an ingredient in your shampoo or having a condition such as lupus can increase photo-sensitivity. In most cases this isn't a true allergic reaction. However, it can cause symptoms similar to those caused by a sun allergy — and if you already have a sun allergy, it can make your symptoms worse." 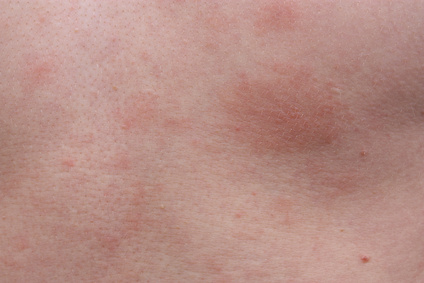 Polymorphic light eruption (PMLE) symptoms usually start within minutes to several hours after exposure to sunlight. A reaction usually starts with itchy skin and tiny bumps (papules) that appear whitish or yellowish on a red background. Flat bumps (plaques) may develop. Inflamed blood vessels can cause your skin to become red and swollen. PMLE, sometimes called sun poisoning, may affect the neckline, the backs of the arms, the face and the hands. Symptoms usually go away within a few days when the affected areas are protected from sunlight. For most people, PMLE occurs in the spring and early summer. It's the most common type of sun allergy. Solar urticaria symptoms start within minutes of exposure to sunlight and can include hives, itching and blisters. Solar urticaria can affect both exposed areas and areas covered by clothes. It occurs most often in older adults. Symptoms usually improve within an hour after covering exposed skin. We have noted associations with certain products in regard to having a strong reaction to the sun. Products such as synthetic sunscreens are set apart from those which are a mineral base formulation. Certain perfumes which are typically worn on the neck and chest area cause a more severe reaction after exposure to the sun. 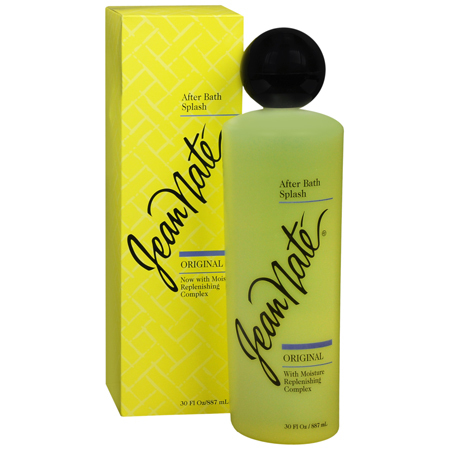 Katherine, our founder, noted that after she used her after bath splash of Jean Nate, she had a reaction, but to a milder degree. She also observed that after her initial exposure to the sun, the sun allergy occurrence does not repeat itself as she begins to see the melanin in her skin deepen. Simple and short exposure to the sun doesn't seem to cause a sun allergy reaction, such as getting your vitamin D dose. However, when more time is spent in the sun where a person actually is increasing melanin production (tan), yet not necessarily a full on sunburn, it appears that no matter how slight, this seems to bring on a stronger allergic reaction. Coming from the info of the Mayo Clinic, remarkably they seem to jell with what we have discovered and from Katherine personally in regard to topical application of certain products, and medications have had longstanding warnings for decades. Let's recap things to be aware of! Exposure to certain substances: Some skin allergy symptoms are triggered when your skin is exposed to a certain substance and then to sunlight. Some common substances responsible for this type of reaction include fragrances, disinfectants and even certain sunscreens. Taking certain medications: A number of medications can make the skin more sensitive to sunlight — including tetracycline antibiotics, non-steroidal anti-inflammatory medications (such as ketoprofen) and sulfa-based drugs. Reactions to oral medications are less common than reactions to medications you apply to your skin. In skincare products, many ingredients do wonders at protecting and healing the skins surface, but if certain essential oils have been added to fragrance them, then it is imperative to keep an eye out for these listed on the ingredient list. Citrus Oils can be problematic for enhancing photo-sensitivity of the skin. However, a key factor to understanding essential oils in the citrus family, is to know that if the essential oil has been steam distilled or cold pressed for addition to a skincare product such as for on the lips. Many have come to the belief that all citrus oils are phototoxic, and we have received our fair share of this question when it comes to our lip colors. Let's clarify this subject: the citrus oils that are steam distilled, are not photo-toxic and are rarely used in aromatherapy because they are less aromatic and don't have the same therapeutic qualities as the expressed citrus oils do. The steam distilled citrus oils are mainly used for flavorings, such as in our lip colors. What makes these steam distilled oils sun safe, is the removal of the chemical agents psoralens and furanocoumarins. Their chemical structure absorbs the energy from UV rays (sunlight or tanning beds) and then releases the energy in a burst to surrounding skin cells resulting in brown spots or burns. However, according to Tisserand and Balacs in Essential Oil Safety, "the expressed oils of mandarin, sweet orange, tangelo and tangerine are not phototoxic. This is due to the quenching effects of other compounds, especially sesquiterpenes that make the unruly furanocoumarins behave. Myrrh is a perfect example. It contains at least ten types of furanoid compound (20-27%)-more than any other oil, yet it is not phototoxic." You can learn more about Robert Tisserand and his excellent information on Essential Oils. Load Up On Antioxidants For Best Sun Protection - It Works! Something we find extremely interesting in doing this research about this weird skin condition, especially as we age, was information correlating with natural sun protection through the topical application and ingestion of copious amounts of antioxidants. PubMed did a study on topical application of antioxidants which showed excellent results. Katherine then located information by Cancer.org on the benefits of ingesting more antioxidants and gave it a try. Katherine's testimony of what she learned from her experiment: "I loaded up on fruits and vegetables, especially those in the melon category and tons of grapes and oranges throughout the winter. I also consumed lots of tomatoes and carrots, along with having spinach in my scrambled egg whites every morning. Berries are another welcome addition to my food choices during the summer months. Strawberries and Blueberries have wonderful attributes for antioxidant therapy. Whether you believe in holistic results or not, I have say, that I noticed a remarkable effect take place when I tried this experiment of mine last summer. I was out in full day sun for more than an hour and absolutely had no sun reaction or sunburn occur to my skin. I was not wearing any sunscreen, just my regular body skincare cream... it was truly quite remarkable, plus I had no sun allergy reaction all summer long." This is definitely one to experiment with since nobody enjoys irritating skin conditions, especially those that are caused by simply enjoying a beautiful sunny day. Enjoy your summer with antioxidant rich foods and an excellent skincare regimen and your skin will look and stay healthy, naturally.